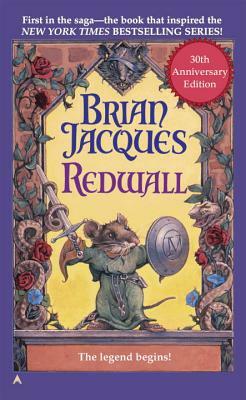 The book that inspired a legend—the first novel in the bestselling saga of Redwall. Welcome to Mossflower Wood, where the gentle mice have gathered to celebrate a year of peace and abundance. All is well…until a sinister shadow falls across the ancient stone abbey of Redwall. It is rumored that Cluny is coming—Cluny, the terrible one-eyed rat and his savage horde—Cluny, who has vowed to conquer Redwall Abbey! The only hope for the besieged mice lies in the lost sword of the legendary Martin the Warrior. And so begins the epic quest of a bumbling young apprentice—a courageous mouse who would rise up, fight back…and become a legend himself. Brian Jacques was both a master storyteller and a jack-of-all-trades. He lived the life of a sailor, actor, stand-up comedian, radio host, bobby, even a bus driver. He was the recipient of an honorary doctorate in literature from the University of Liverpool and a New York Times bestselling author of more than twenty-five books for younger readers, including the wildly popular Redwall series. Dr. Jacques was a lifelong resident of Liverpool, England.